We are having a bit of egg fun this week. Yes, I know that Easter has come and gone, but we were on Spring Break the week before Easter. So, it was now or never. I chose now. One of my favourite egg books really has nothing to do with eggs, even though an egg is the main character. Eggbert is everyman. There was once an egg named Eggbert. 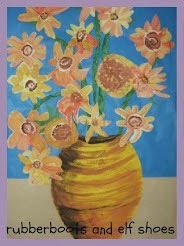 He loved to paint beautiful pictures. Eggbert's paintings always cheered up the other eggs in the refrigerator. But one day it was discovered that Eggbert was slightly cracked. Cast out of the refrigerator because of a small crack, Eggbert sets out into the world, using his talent for painting to try and blend in. Eventually, he realizes that cracks are everywhere and reminds us all that our flaws are perfectly natural. 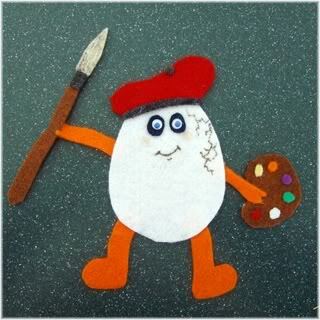 Who wouldn't fall in love with an egg who wears a red beret and carries a palette and a brush. An egg who recreates himself time and time again in order to fit it. An egg who realizes that his "imperfection", his cracked shell, is just one of many lovely cracked "imperfections" in the world. 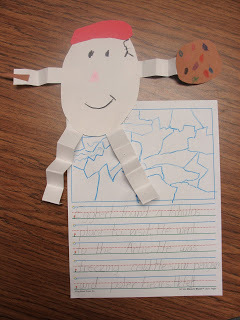 My kindergarten kidlets don't really care about Eggbertian philosophy. What they do care about are the vibrant, engaging illustrations, the humour and easy to read aloud text. And my bet is, that some of the message that it is okay, even beautiful to be imperfect, will stick. Hopefully it will invade their psyches. Mrs Saylor uses Eggbert to teach synonyms. I like her kids' Eggbert creations with their cute berets. Eggbert is a perfect retelling story. Laptime and Storytime made beautiful flannelboard set. 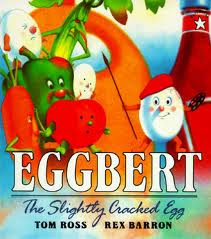 I would be inclined to just make Eggbert and retell the story with the book. I think that all my kidlets have felt "evicted from the refrigerator" at some point. We can chat about what Eggbert did after being rejected by his friends. He enjoyed doing what he was good at. And he still sent them postcards. I love this "movie trailer" for Eggbert. Brilliant. 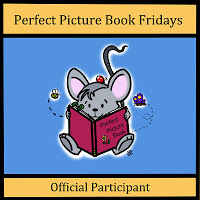 Susanna Hill's Perfect Picture Book Friday is the perfect place to find fabulous picture books on any topic. She has them organized by theme and by title. It looks like a lovely book! 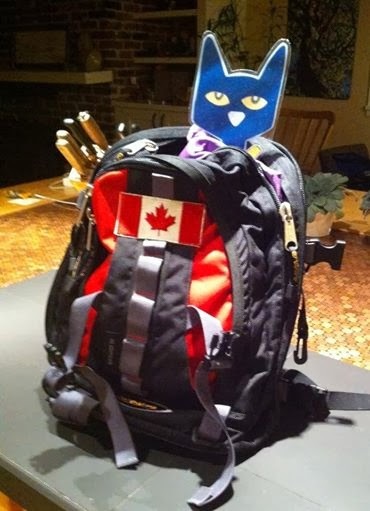 I'm feeling more than slightly cracked today...Last day of spring vacation! You're right, a great video trailr on the book. What better way to teach kids about flaws than through a cracked egg! Really nice choice. Funny, I boiled eggs this morning and one cracked, and I fed it to the dog -- now I feel bad. What a great title, that alone i a winner. I can imagine slightly older kids getting even more out of the text! Very clever and great spring choice. This is a new one for me and it looks like a winner! 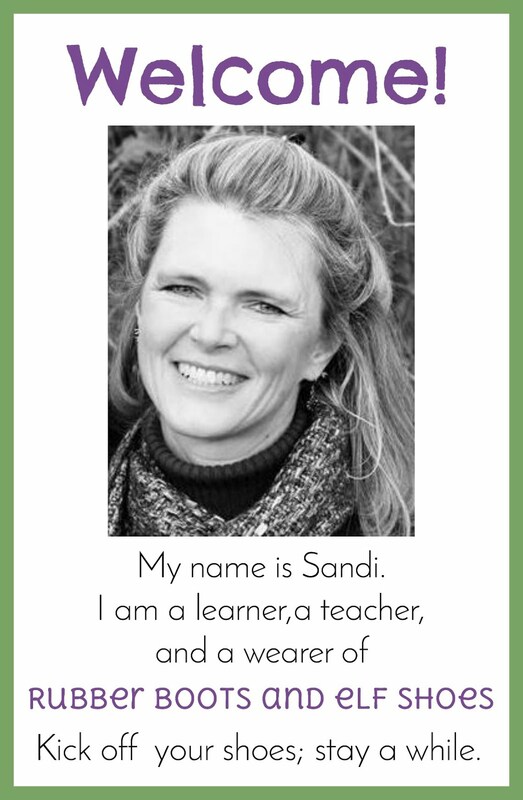 Thanks, Sandi. Great book. I love the fact that even though the original publication date is fairly old, someone made the darling book trailer to keep the back list selling.